Huntington disease is an autosomal dominant disorder which affect gene on chromosome no 4 which leads to cognitive impairment, involuntary jerky movement and finally lead to dementia. There will be atrophy of the putamen, caudate nucleus, frontal lobe and globus pallidus. Huntington disease is caused by increasing number of CAG repeat. Huntington disease may present with anticipation which is the term used to describe a case where the number of repeats increased with new generation which lead to a more serious and severe outcome/manifestation of the disease.Huntington disease may begin at middle age and fatality is common around 20 years after diagnosis. Other disorders that may present with anticipation phenomenon are myotonic dystrophy and fragile X syndrome. Huntington disease pathologically may present with fibrillary gliosis and loss of the GABAergic neuron/striatal neurons. 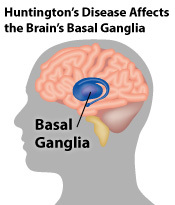 Huntington disease may present with dilation of the third ventricle and lateral ventricle. Supportive and symptomatic treatments may be required to treat Huntington disease. 1.Walker, Francis O. “Huntington’s Disease.” The Lancet 369, no. 9557 (January 2007): 218–228. doi:10.1016/S0140-6736(07)60111-1. 2.Margolis, Russell L., and Christopher A. Ross. “Diagnosis of Huntington Disease.” Clinical Chemistry 49, no. 10 (October 1, 2003): 1726–1732. doi:10.1373/49.10.1726.